** Based on early-stage marketing studies, the PEA assumes that a nickel-iron-chromite concentrate grading 13.5% nickel will realize 75% of the three-year trailing average LME nickel price of US$9.39 per pound. The PEA assumes no by-product credits are realized for iron or chromium. *** Includes Federal income tax at 15%, Provincial income tax at 11%, and the British Columbia Mineral Tax at 13% (applied to adjusted net revenue). The results of the PEA demonstrate the positive potential for establishing a greenfield open-pit nickel mine and an on-site magnetic separation and gravity concentration processing plant, using conventional technology and equipment. At a projected throughput rate of 114,000 tonnes per day (or 40 million tonnes per year) over a mine life of 24 years, annual production averages 37,369 tonnes nickel, or 82.4 million pounds, in concentrate at an operating cash cost of C$3.23 per pound. The PEA provides a preliminary assessment of the nickel-iron alloy’s economic potential, based on early-stage marketing studies. The PEA assumes that a nickel-iron-chromite concentrate grading 13.5% nickel will realize 75% of the London Metal Exchange (“LME”) nickel price. The study assumes no by-product credits are realized for iron or chromite. 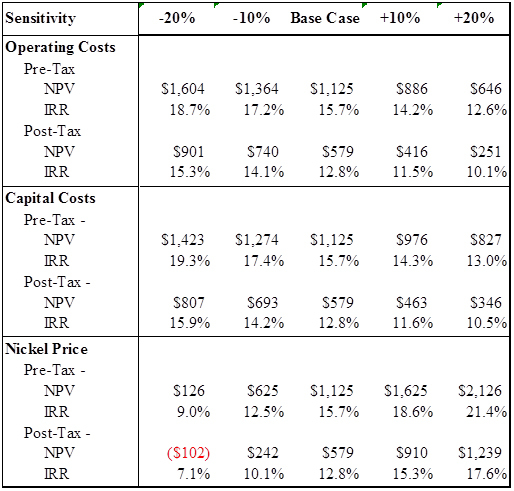 Based on these first-pass assumptions, the Baptiste deposit, on a 100% basis, generates a pre-tax net present value (“NPV”) at an 8% discount rate of C$1,125 million and an internal rate of return (“IRR”) of 15.7%, using an average realized nickel price of US$7.04 per pound. The nickel price is calculated based on realizing 75% of the three-year trailing average nickel price of US$9.39 per pound. On a post-tax basis, the project has a NPV of C$579 million and a 12.8% IRR, assuming aggregate statutory rate for federal, provincial and BC Mineral Tax of 39%. The initial capital cost is estimated at C$1,384 million, with a payback of 6.4 years. Sustaining capital over the life-of-mine is a further C$763 million. While the results of the Tetra Tech PEA are promising, the study, by definition, is preliminary in nature and includes inferred mineral resources that are considered too speculative geologically to have economic considerations applied to them that would enable them to be categorized as mineral reserves. There can be no certainty that the PEA will be realized. It is important to note that mineral resources are not mineral reserves and do not have demonstrated economic viability. The PEA is based on an optimized pit shell containing 730.3 million tonnes of diluted indicated mineralized material grading 0.119% DTR nickel and 195 million tonnes of diluted inferred mineralized material grading 0.114% DTR nickel, while allowing for 8% mine dilution, 82% milling recovery, 45-degree pit slopes and a life-of-mine stripping ratio of 0.17:1. *Note:. Mineral resources which are not mineral reserves do not have demonstrated economic viability. Inferred mineral resources have a high degree of uncertainty as to their existence, and a great uncertainty as to their economic and legal feasibility. It cannot be assumed that all or any part of an Inferred Resource will ever be upgraded to a higher category. The Baptiste deposit remains open along strike in both directions, to the southeast in the higher-grade south-central area and at depth over the entire system providing future potential to significantly increase the size of the resource. Further drilling to determine the extent of the higher-grade mineralization in the southeast area is recommended by Caracle Creek. The limited amount of exploration drilling on the Decar Nickel Project completed to date also clearly indicates there is substantial potential for additional discoveries. Sensitivities were also run around key revenue and cost variables. These are summarized in the table below. *Sensitivity to nickel price can also be read as a proxy for the revenue impact of equivalent percentage changes in head grade, recovery, and % LME nickel price realized. The PEA is based on a conventional open-pit mining operation using traditional blast, truck and shovel methods, and a processing facility of 114,000 tonnes per day (40 million tonnes per year). Processing of the Baptiste deposit will involve a simple two-stage process to produce a nickel-iron-chromium concentrate. The process will consist of a primary coarse grind to P80 600 microns, followed by rougher magnetic separation, then a regrind to a P80 70 microns size fraction and Knelson gravity concentration to recover a nickel concentrate grading 13.5%. The process recovery flow sheet and projected nickel recoveries are based on initial laboratory scale metallurgical studies carried out by SGS Canada Inc. and Knelson Research and Technology Centre in 2011 and 2012 on representative mineralized composites from the Baptiste deposit. At the assumed processing rate, the forecast in situ Ni metal in the concentrate is as follows. *Head grade takes into account 8% mining dilution (zero grade material). The Decar Nickel District is 245 square kilometres in size and covers part of the Mount Sidney Williams ultramafic/ophiolite complex 90 kilometres northwest of Fort St. James in central British Columbia. The project has significant infrastructure advantages. The property is a two-hour drive from Fort St. James on a high-speed logging road (the first 40 minutes of which is a paved road). A branch line of the Canadian National Railway is less than 5 kilometres east from the Baptiste deposit and the BC Hydro power grid is within 110 kilometres to the south of the property. Total operating cash costs C$6.91 per tonne or C$3.23 per lb. Total capital cost estimates are outlined below. The initial capital cost to bring the Baptiste deposit into production is C$1.384 billion, with additional life-of-mine sustaining capital forecast at C$763 million. The overall capital cost has been compiled with an estimated accuracy level of +/-26%. Cliffs engaged an independent consulting group to assess the marketability of nickel-iron-chromium concentrate with a grade of 15% total nickel, and a lower grade concentrate of 4% total nickel. The current process flow sheet is expected to produce a 13.5% nickel concentrate, also containing 45% – 50% iron and ~2.0% chromium. Assays performed on the two concentrates confirm that most of the nickel is present as awaruite, a naturally occurring metallic nickel-iron alloy. Magnetite is the dominant mineral present in the concentrate. The major gangue species present is serpentine. The study confirmed a number of potential customers would find the concentrates suitable and, in some cases, desirable. Both concentrates would make a potentially desirable feed to any ferronickel plant, while the higher-grade 15% nickel concentrate would also be a suitable feed for a sulphide smelter, albeit a more desirable feed to Roast Reduction than Flash Furnace due to the overall higher recovery of nickel. The study also found that the lower-grade 4% nickel concentrate is suitable feed for nickel pig iron plants in China, but the estimated realized value in this market is much lower, at 36% of the LME nickel price, than other alternative markets for Decar product. Based on these findings, the PEA assumes a 13.5% nickel-iron-chromite concentrate will realize 75% of the LME nickel price. The PEA assumes no by-product credits are realized for iron or chromite. In terms of suitability as direct feed to stainless steel production, the marketing study recommends further evaluation is necessary to determine if this is a valid alternative. Additional infill drilling to increase the confidence of the Inferred resource such that the Inferred resource at the edges of the Whittle optimized pit can be classified as Indicated. Pilot-scale testing of an optimized beneficiation circuit including magnetic and gravity separation. In addition, Caracle Creek recommends a separate diamond drilling program of 13 holes totalling 7,800 metres to step-out on the potential higher-grade extension of the Baptiste deposit in the southeastern area. Mineral resources are not mineral reserves and have no demonstrated economic viability. Mineral resource estimates do not account for minability, selectivity, mining loss and dilution. These mineral resource estimates include inferred mineral resources that are normally considered too speculative geologically to have economic considerations applied to them that would enable them to be categorized as mineral reserves. There is also no certainty that these inferred mineral resources will be converted to measured and indicated categories through further drilling, or into mineral reserves, once economic considerations are applied. The mineral resource estimates referenced in this news release use the terms “Inferred Mineral Resources.” While these terms are defined in and required by Canadian regulations (under NI 43-101), these terms are not recognized by the U.S. Securities and Exchange Commission (‘SEC”). The SEC normally only permits issuers to report mineralization that does not constitute SEC Industry Guide 7 compliant “reserves” as in-place tonnage and grade without reference to unit measures. U.S. investors are cautioned not to assume that any part or all of the mineral deposits in these categories will ever be converted into reserves. None of FPX Nickel’s securities has been registered under the United States Securities Act of 1933, as amended. The above technical information and all the other technical information on this website pertaining to geology and drill hole data was prepared under the supervision of FPX Nickel’s Chairman Dr. Peter Bradshaw., P. Eng., a Qualified Person as defined in National Instruments 43-101 – Standards of Disclosure for Mineral Projects.